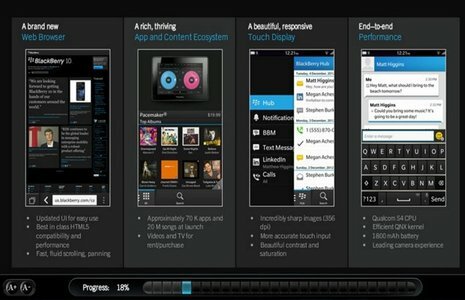 News: BB 10 Sales Training Manual leaks, promises 70k apps at launch. Home Phones BlackBerry News: BB 10 Sales Training Manual leaks, promises 70k apps at launch. Crackberry claims to have got their hands on the training manual for Blackberry 10 that should re-fuel your excitement for the launch date.The leak is a Powerpoint slideshow that apparently contains screenshots from an online course for sales people. Thus apparently there was a loose end there which led to this journal reaching a file hosting site. The document claims that the new Blackberry 10 Browser is supposed to be “best-in-class” with its impressive HTML5 capabilities. Also something it claims is 70 thousand QNX apps by the launch date – although its not completely known how many of them are totally new and fresh or how many are ported. Also this should bring a smile for all the tech-minded shoppers as some specs were mentioned regarding the Qualcomm Snapdragon S4 CPU being used and a1,800mAh battery and a 356 pixel density display that tallies with what we’ve already seen of the 4.2-inch 720p screen.